When an oil pressure switch is actuated, it will normally either raise an alert or automatically open or close a valve to interrupt or continue the flow of oil, providing a cost-effective safeguard for expensive engines and machinery that rely on oil for smooth operation. An oil pressure switch may be programmed to different actuation points depending on its particular function. Oil pressure switches are designed for alarm, shutdown, and control of many different processes and equipment, and thus work well in any instance in which regulation or measurement of oil flow is required. This makes them useful for applications such as generators, process machinery, off-road equipment, motors, turbines, aircraft, automobiles and pipelines, and for industries including aerospace, automotive, utilities, process manufacturing and more. The most common use of oil pressure switches is in automobiles: if the oil pressure in the engine drops to a critically low level, the oil pressure switch triggers a warning light on the dashboard for the operator to address the problem before the engine runs dry and destroys itself. An oil pressure switch measures the amount of oil pressure in a given space by means of a transducer that translates the force of pressure into an electric signal. The pressure sensor is built into a force collector such as a piston, strain gauge, diaphragm, bourdon tube or bellows, which measures the strain or deflection caused by the oil. A common mechanical design involves an elastomeric diaphragm in a pressure cavity that expands or contracts depending on the pressure. Electronic pressure switches usually make use of a piezoresistive pressure sensor that converts the pressure strain level directly into an electrical signal. Oil pressure switches may include an analog or digital display that shows the pressure reading, or may simply rely on the automatic switching functions without any human interface. 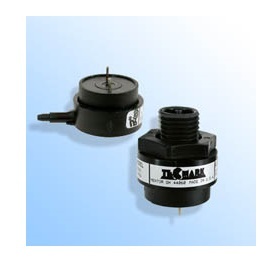 Construction materials for oil pressure switches vary depending on the application, but can include acetal, brass, polycarbonate, plated steel, glass reinforced polyester, polyvinyl chloride and cast aluminum. Some things to consider when looking for an oil pressure switch are accuracy, pressure range, electrical connection, body material, display type, temperature compensation, temperature output and field adjustability. The advance of oil pressure switch technology has made oil pressure switches an integral part of making processes involving pressurized oil safe and dependable. Oil Pressure Switch An oil pressure switch is a type of hydraulic pressure switch that measures the pressure of oil in a system and reacts in a specified way when the pressure rises or falls to a certain level.